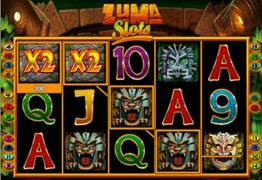 Zuma Slots has a Pacific Island Jungle theme, entertaining players with tribal music, chanting and elaborate Polynesian masks. This is a 5 Reel, 20 Payline game, with outstanding features for slots fans, including a free spins bonus round and a gamble feature, catering for all players from beginners to highrollers. 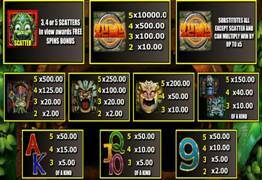 Zuma Slots can be played from as little as $0.01 per spin, with a 10,000 coin maximum jackpot. The Wild symbol is the Zuma Slot symbol, and this substitutes for all except the Scatter symbol. Different Polynesian masks act as the higher paying symbols on the reels. Colorful high value card symbols are the lower paying symbols. Reel 1 - 50% chance of success, x payouts by 2. Reel 2 - 25% chance of success, x payouts by 4. Reel 3 - 20% chance of success, x payouts by 5. Reel 4 - 10% chance of success, x payouts by 10. If players have any money in the Winnings panel, they can choose to Bank. Then half the amount will be secured and players can gamble with the other half. Should players choose to Collect, then they get awarded the whole amount and the gamble game ends. The Free Spins Bonus will be triggered by 3 or more Scatter Mask symbols. Players shoot the Tiki Boss which reveals the amount of free spins. Once the free spins are completed, the player chooses another Tiki Boss to reveal a multiplier, which will be applied to the player’s total. Zuma Slots Bonus Round will be triggered if a player hits 3 or more of the Frog Scatter Symbols, which will activate the Free Spin Bonus round. Zuma Slot is a fun new game inspired by the cult Popcap. Players find themselves in an ancient, dense jungle with a quest to find secret riches. A lot of adventure and mystery with fun rewards!! Unfortunately Wagerworks does not offer the option of Rand Play, but SA Players can play in Dollars.